Adequate risk management is especially important in safety-critical industries such as the development of healthcare technology (with the design and manufacturing of medical devices), aviation & aircrafts, transportation, as well as the automotive industry due to the risks associated with the correct functioning of these products. Increasing complexity of such safety-critical products increases risks faced by manufacturers, as serious injuries or death could result from the malfunctioning of these devices. 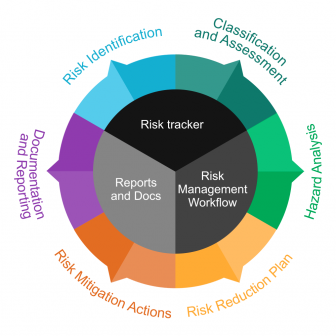 A way to mitigate and optimize these risks is therefore required to compensate for increasing risk levels. Safety critical industries are regulated by strict local or international standards all around the world. These standards describe the processes and activities that need to be covered in order to achieve the high reliability and safety of products. Therefore in safety-critical industries, the role of Application Lifecycle Management solutions to support the design, management, testing, and auditing of regulated lifecycles is vital. In addition to mature processes used during requirements definition, product design, development, and testing, applying a comprehensive risk management lifecycle is a key way to achieve the high quality standards of application development in safety-critical industries. To understand its importance, just look at some statistics from the medical industry published by FDA (the US Food and Drug Administration). Analyzing historical data from the past 5 years, it is clear that the number of software recalls increased by 100% from 2010 to 2011. Also, the number of 1st class recalls increased, which is the classification of the most dangerous malfunctions that can cause serious injury or death to patients. In the first half of 2014, 30 new 1st class recalls were published, which means 30 different medical devices contained software with bugs, posing a serious hazard of causing injury or threatening human life. In Intland Software's codeBeamer ALM, all of theses steps are supported via specific trackers, uniquely designed workflows, as well as a built-in wiki and special documentation & reporting features. Those results can help achieve full traceability on the entire lifecycle, reduced cost of execution and audits, and increased safety by ameliorating product quality. codeBeamer ALM comes with preconfigured FMEA functionality to support your failure mode analysis processes, as well as advanced monitoring and reporting options on all risk management activities. To learn more, watch our webinar recording on risk management from Feb 2016, contact us with your questions, or simply start your free trial of codeBeamer ALM right away!